I am really not sure where to start! I have struggled with medical issues my entire life. I am 25 born with many anomalies–bladder, cleft lip/cleft palate, dilated aorta, hydronephrosis…the list really goes on and on. Thankfully, I have had great doctors and everything is under control until recently. I had my first appointment with my new endocrinologist. She listened to my history that I highlighted for her and she actually took the time to *think* about me and all of my little medical issues. It was great to see her brain trying to piece things together. When she was doing my exam, she gently touched my shoulders and made a comment that my shoulders were holding a lot of weight. I said that I’ve noticed and that it makes me feel that I look like a football player. She told me that it isn’t that bad, but then asked me if I have stretch marks on my body. I told her that I do and that I’ve actually noticed that they are getting worse and deeper than usual. She looked at my belly and she said that she wants to get my checked for Cushings Syndrome. She asked if I was on any steroids, and I am not, but I did have a pituitary cyst in 2008 that was surgically drained (specifically a Rathke’s Cleft Cyst). 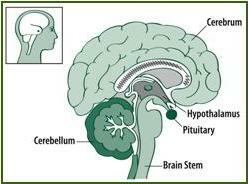 From what I’ve learned, whenever a doctor works near the pituitary there is a risk that hormones will be effected. This may be what is happening to me. » Muscle weakness– my leg muscles get tired very easily, even just walking a few blocks. It feels like I have shin splints, at times! » Hypertension–possibly, but undetected because of I am on meds for other heart anomalies. » “moon face”–it isn’t too bad, but it is noticable. Today I got my blood tested with the dexamethasone. I don’t know how long I have to wait for results, but I am really fighting urges to call my MD immediately. I found this board because I need support. I am nervous for what my future holds because I really don’t want to have ANOTHER brain surgery, but I think all that I can do it be positive and wait. Thanks for this forum! !